Home to numerous popular food venues Hockley is now also the home of Bar Iberico – which now inhabits a prime location on Carlton Street. Previous tenants haven’t lasted very long with names like Pico and Pilot not surviving despite significant backing. However, if anyone can make it work it is probably the Iberico team. They have 2 more Tapas restaurants in the group, one in Nottingham, one in Derby and also own the more formal fine dining offering of World Service. The doors were opened this week and the look and feel will be familiar to anyone eating in recently refurbished restaurants over the last year. The layout is quite unique, a large central bar surrounded by stool seating as well as a handful of other tables scattered around. There are less similarities than I expected from the refined offerings of their original restaurant. A pizza oven has been inherited from previous owners so the first new addition is a range of flatbreads. A dozen of the usual tapas dishes remain alongside a few items from the grill. Of the 6 or so dishes we tried 3 stood out for me as being very good. Crispy chicken with spicy Jerez sauce already seems to be a cult favourite, the sort of food you could sit with a glass of wine and eat in unlimited amounts. The spice is mild but reminiscent of the sticky sweet chilli of Asian cooking. 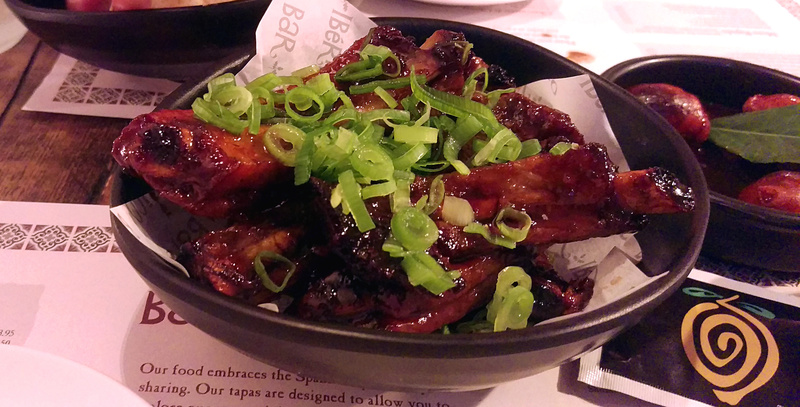 In a similar vein pork ribs were served with a glaze inspired by Oloroso sherry. I haven’t had ribs as enjoyable for a while, the meat flavourful and falling off the bone. My final favourite was wood fired mussels in white rioja, Migas. The Migas element is inspired by a Spanish dish of fried leftover bread and provide a little texture of a dish that rarely has any texture to it. The shellfish themselves were plump and juicy, the wine coming through complementing them nicely. A pork ‘pincho’ (‘on a skewer’) from the grill had a little smokey taste from the charring but no depth of flavour – some sort of dipping sauce would have been ideal. Chorizo is a classic that I can’t fail to enjoy, here it is served in red wine. It was good but I have been spoilt by the honey glazed version at Baresca. Some Padron peppers were as enjoyable as ever, you can’t go far wrong with a bowlful and a cold beer in my opinion. On that note it was nice to see they also included a ‘proper beer’, Charles IPA, which I happily downed a pint of. Desserts lacked inspiration, the favourites remained but today I didn’t fancy churros or crème Catalan. Bar Iberico is not as polished and refined as Iberico itself, but that is to be expected. The hallmarks of its parent company remain with interesting combinations with Spanish tapas at the heart. Prices generally came it at £1 or so less than their main venue, rightly so with the less complex dishes. Small plates can always add up but I still feel it represents good value for what is on offer. I think Iberico still represents the best tapas in the city, Bar Iberico firmly competes with Baresca in the more casual end of this market. They both have their strengths and different dishes that stand out. Bar Iberico serves slightly better food but Baresca has a larger and more diverse menu. I’m not sure what planet you’re on. Baresca is nothing on this place. This place, in my opinion, has achieved what it set out to do. It’s the top place in Nottingham right now. So, you’ve marked them down, a place of casual dining and a place not designed to be a full-on restaurant, because they don’t have the variety. Your use of scales seem extremely arbitrary. Why only 7.5 out of 10 for value? 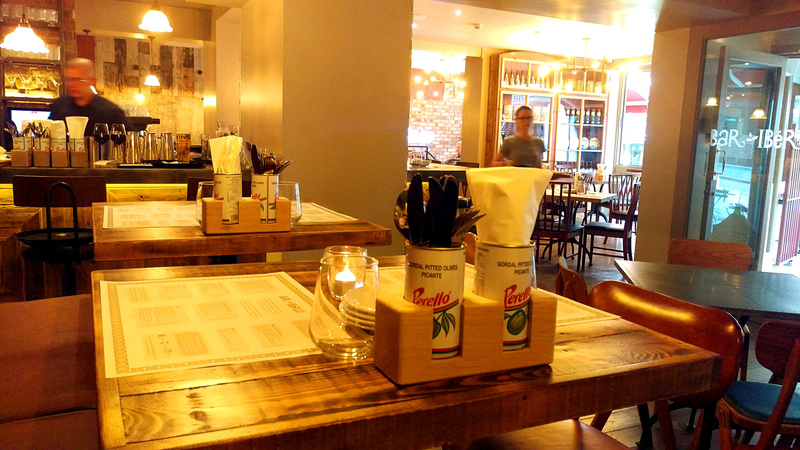 Before 6pm you can pay £8.95 for dippy sourdough and 2 tapas dishes which will leave most people very full. Where can you spend sub £10 and get this quality and speed of service? For reference, this is Planet Earth. Scoring can be difficult, it is entirely down to my opinion on what I ate and how I felt which is a limitation of my blog I am afraid. It can be difficult to rate somewhere more casual on a scale against a full-on-restaurant. It is great that you are so positive about Bar IBerico and I am certainly a fan of the group and will return, I may revisit my scoring if I feel it better or worse than my first review. I appreciate yours, and anyone elses comments as ever! On the subject of scoring, I would suggest each restaurant should be scored according to its type and therefore expectations. This is a more casual dining restaurant… if it were to score higher than a fine dining restaurant it shouldn’t necessarily mean it is “better”… but simply that it has done a better job at delivering what it has set out to do.